The Boston Bar Association has announced that Goulston & Storrs attorney Suma Nair will serve as a member of the Association’s governing Council for the 2014-2015 program year. She will assume this position on September 1, 2014. Suma is an attorney in the firm's Private Client and Trust group, where she provides sophisticated estate and tax planning advice for high net worth individuals, counsels clients regarding charitable giving, and advises generally on family and tax matters involving business and wealth succession. She also represents professional and family fiduciaries in connection with estate and trust administration. Suma currently serves as Co-Chair of the Trusts and Estates Section of the BBA and has served on the Trusts and Estates Steering Committee for the past nine years in a number of capacities, including as Co-Chair of the Public Service and Public Policy Committees. She was a member of the 2013 Annual Law Day Dinner Steering Committee and has presented at numerous BBA-sponsored educational programs. 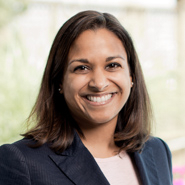 Suma also serves as a volunteer lawyer for the Legal Advocacy & Resource Center and is a member of the Board of Directors of On The Rise, a day program that supports and advocates for homeless women in the greater Boston area. Suma is a graduate of Dartmouth College and Harvard Law School.